Fall is truly my favorite season. I love the cooler temps, crisp night air, falling leaves, bon fires, and the harvest fall brings with its abundance of apples, pumpkins, winter squash, root vegetables and so much more. Recently I ordered 40 lbs. of Honey Crisp Apples from my favorite local market, Camden City Market. They were gorgeous, and so I set out to "put them up" in applesauce and caramel apple jam, plus I made my mom's apple sour cream coffee cake. 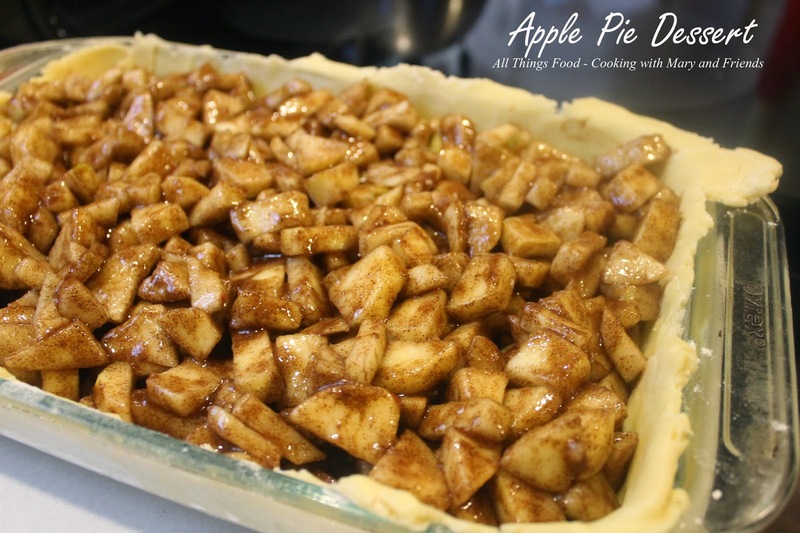 I had a dozen apples left, so I used them to make this Apple Pie Dessert. Not your typical apple pie in shape, but rather it's baked in a 13 x 9-inch pan. 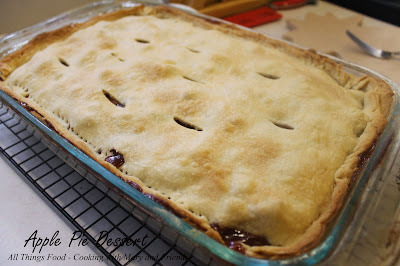 The squares are easy to serve up, and my Pyrex pan comes with a lid, so the dessert is easily stored. I love that little convenience. Mix flour and salt in a large bowl. Cut in shortening with a pastry blender or fork until the mixture resembles course crumbs. Add the cold water and stir until dough forms a ball, being careful not to overwork the dough. Divide dough in half. On a floured board, roll out one piece of dough into a 15 x 10" rectangle. Carefully fold dough in half and lift to place in 13 x 9-inch baking dish, with the sides of the dough up the walls of the pan. Roll out next dough ball the same as the first. Place chopped apples in a large mixing bowl; sprinkle lemon juice or Fruit Fresh over apples tossing to coat. In a small bowl, mix sugar, instant clear-jel (or cornstarch), cinnamon and nutmeg. Pour over apples and stir to coat. Pour apple mixture on top of crust in pan. Top with remaining rolled out crust, crimping top down with sides of bottom crust and trimming excess. Cut several slits in top of crust. 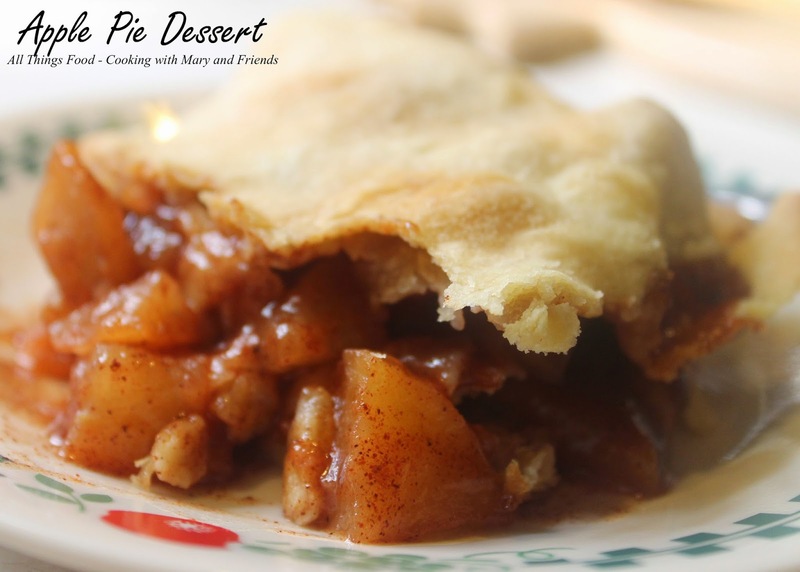 Bake in preheated 425 degree oven 40 minutes or until apples are bubbly and crust is browned. Cut into serving pieces and serve. Top with whipped cream or vanilla ice cream if desired.